Uncategorized | I'm an Undertaker. I know Startup Riot was 2 days ago and most people have already written their summary posts… but I’m just now recovering from it. It’s like I have a Startup Hangover! The event was a smashing success this year. Maybe it was because I was presenting this year, but the energy in the Fabulous Fox Theater was AMAZING. People were buzzing around, meeting new potential customers, business partners, co-founders… maybe even investors! The cacophony in the exhibit hall was thunderous. It was wildly exciting. By the time we left to go to the after party I was losing my voice! I haven’t talked that much in one day in a long time! This year’s keynote speaker was Bo Peabody who founded Tripod.com and later sold it to Lycos. He’s now a venture capitalist running a family of smaller funds called Village Ventures in Massachusetts. He broke down his personal history with Tripod and Village Ventures and opined on the nature of the word “entrepreneur” and joked about how it literally means “undertaker”. Every venture he’s been associated with has been at death’s door at some point so both meanings are appropriate! He talked about the doggedness required to succeed as an entrepreneur and gave examples of how the best defense is a gracious offense and how entrepreneurs get screwed ALL THE TIME. 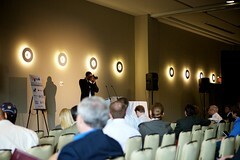 He was a great keynote, took some questions from the audience afterwords and was very accommodating. I thought we were pitching in the second block of startups so I would have some time to practice. I thought maybe if my nerves were still jumpy I could have a beer at lunch and chill a bit… but it turns out something got scrambled a bit and we went up in the first block. I had to go third, right after Ben Dyer who was pitching for MediaSode and did a great job. I had been going over and over my new rough outline. I had re-written my pitch several times the night before – and once that morning. I went to Startup Gauntlet the night before and got a lot of truly great feedback from Paul Freet, Jeff McConnel and Keith McGreggor. Those guys are awesome and Startup Gauntlet is something many more entrepreneurs should attend. I tried to work in something about entrepreneurs getting screwed from Bo’s keynote. I made sure to say that I could help them with one of the ways that they get screwed: the outrageous expense of hardware PBX solutions. The rest is a little blurry. I know I made people laugh somehow. I honestly don’t remember what I said. I guess I was pretty nervous but I got tons of compliments via Twitter afterward so I think I did alright. We came in fourth in the voting behind LessAccounting, Regator and Nexpense so we didn’t win a netbook but I was mightily pleased with our finish. 4th out of 50 is great, actually – especially if you look at the companies that came in ahead of us. We talked to people at our table for a while when the event was over but we eventually made it down the street. We had great conversations with Jen Bonnet, David King, Josh Watts and Richard LeBer. Josh gave me insight into the company I work for currently. He’s a great guy and smart as hell. I’m glad I finally got to meet him in person after all this time talking to him on Twitter. 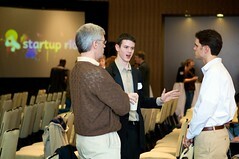 Richard, Walter (my co-founder) and I talked extensively about strategy for OtherNumber. I had met Richard once before at an “Open Lunch” at Which Which in Norcross but this was the first time I got to sit down and really talk to him. Needless ot say, I’ll be making it a point to spend more time with him in the future! Go to StartupRiot next year. Just do it. GO. Seriously. I made connections with about 20 different companies. I still haven’t entered all their business cards into Highrise yet. I talked to potential customers, partners, consultants, investors, advisors…. you name it! Several people told me there that they’d sign up for accounts. I call that a WIN! Well, I can officially talk about it! I’m presenting OtherNumber at StartupRiot today! You can watch the whole thing live on startupriot.com if you aren’t in the audience which you should be. I can’t wait to see what the BackNoise channel looks like while I’m up on stage. Bring on the Snark. We’re running a special promotion today, in honor of StartupRiot. If you add funds to your account today and use code “startupriot” you get a 30% bonus on the house. So let’s go! StartupRiot is awesome and we’re super excited to be here. Come find us!